Yesterday my US visitor and I went to the St Ives and Northbridge Quilt Shows. Both shows were well worth the 3 hour round trip we took. My “Scquilter” friend Heather Watts had several quilts in the St Ives show and gave me permission to photograph them. 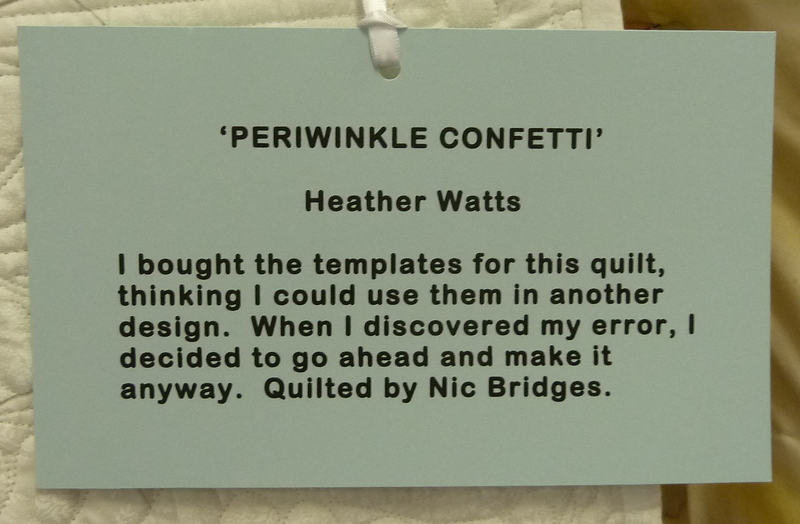 I have shown my favourite – Periwinkle Confetti – which was quilted by Nic Bridges, below as well as her statement about it. Another beautiful quilt of Heather’s adorns the entry window, unfortunately I couldn’t get a good photograph to show you as the window frame was in the way so you’ll just have to go and see for yourselves. 🙂 Here is another of hers though that was at the entry doorway. It is called Delightful Doors and was adapted from a Kaye England design and was quilted by Evelyn Gray. The St Ives show also had a section devoted to the work of the late Narelle Grieves. This body of work was very interesting. I especially liked a piece that was a whole of cloth quilt which was made in 1995 and was based on an old Wunderlich ceiling pattern in an old home. The silk quilting stitches were tiny and the pattern just exquisite. Unfortunately I don’t have permission to reproduce it here. There were, of course, trade tables and I bought some goodies but I’ll show them another time. In the meantime, if you’re in Sydney and have a chance, do go and visit these shows they are really beautiful. Oh, and the flowers at the Northbridge Show were just as stunning as the quilts.